Buy Hard Copies of English Banana.com Workbooks Here! 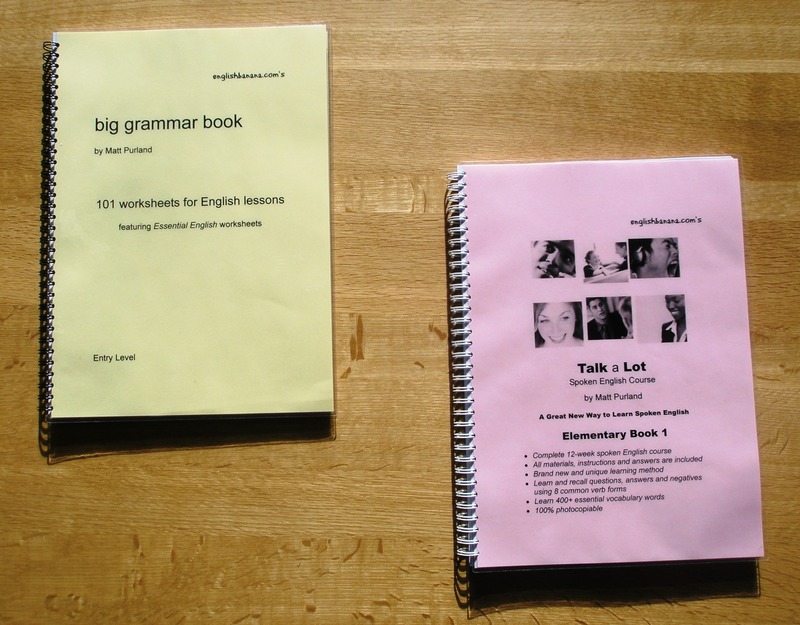 Big Grammar Book and Talk a Lot Elementary Book 1 – Hard Copies! Now you can buy hard copies of two of our most popular books from English Banana Trust. Both books are sturdy wiro-bound volumes with laminated covers, which will prove really handy when you are photocopying them all day! Both books cost £22 each, with all of the proceeds going towards the work of English Banana Trust, which is a charity set up to support the English Banana.com website. Categories: Books, English Banana Trust, News | Tags: book, English, English Banana Trust, ESL, material, practice, Talk a Lot | Permalink. Now it’s easy to download all 11 free English Banana.com printable resource books in one go! Now, for the first time, you can download all of our fabulous free printable books with one click! Simply click the button below to download a zip file containing all of our books! There’s plenty of printable material there for all your English, ESL, or ESOL class needs! And don’t forget that all of our material is covered by our unique Free Copying Licence and Free Licence to Run Courses (see the video directly below for more information). Hope you enjoy using this material – and if you do like it, please tell a friend! Thanks! Categories: Blasts from the Past!, Free Printable Worksheets, News, recommended | Tags: book, download, English, ESL, free, material, printables, Talk a Lot | Permalink. Categories: Free Printable Worksheets, New Material, recommended | Tags: adjectives, download, EFL, English, ESL, ESOL, free, material, study, tips, vocabulary | Permalink. Categories: Free Printable Worksheets, News, recommended, Video | Tags: advice, book, download, English, ESL, free, material, study, teacher, video | Permalink. Categories: Free Printable Worksheets, New Material, News, Online Lessons, Video | Tags: advice, download, English, ESL, Facebook, free, grammar, material, online lessons, teacher, Twitter, video, vocabulary, Youtube | Permalink.